3rd Annual FREE Furnace Giveaway! 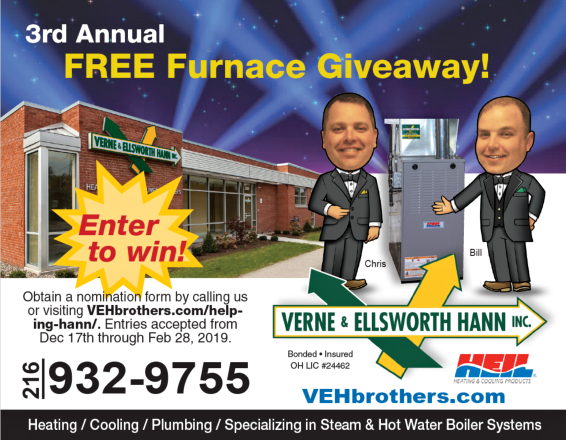 We are now accepting nominations for our third annual Helping Hann FREE furnace giveaway! A deserving member of our community will receive a free furnace and installation. The winner will receive a new high-efficiency heating system and installation, with a total value of up to $3,500. Visit our website, VEHbrothers.com, for details and to fill out a nomination form. Verne & Ellsworth Hann has been located in Cleveland Heights for the past 64 years. The Helping Hann contest was created to provide heat for a deserving homeowner in our community. It’s the highlight of our year and we look forward to continuing the tradition!